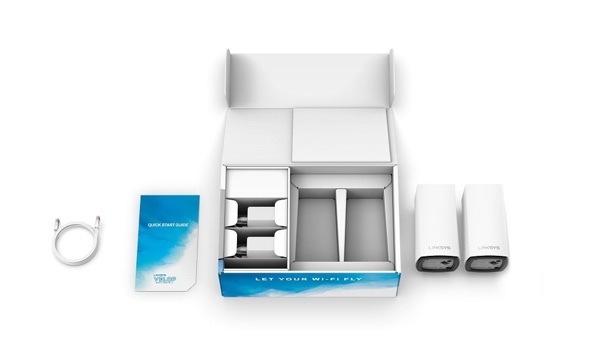 Fancy a whole-home intelligent WiFi mesh system just in time for the turn of the year? Well, if you have a spare $100 burning a hole in your pocket, and you’d rather spend it on tech than a New Year’s Eve night out, then we have just the deal for you. Intelligent mesh systems generally solve a problem that a lot of home-owners face these days. If you live in a property of a certain size, or which spans over multiple floors, then you can sometimes find yourself in a system where your internet just does not get distributed successfully and evenly throughout the property. Some home-owners tend to invest in range extenders and other hardware of that nature but it ultimately doesn’t come close to offering the type of experience and rectification that a whole home mesh system can provide. That’s where this Linksys Velop system comes into its own. This purchase is ideal for 3000 sq.ft., 2 to 4 bedrooms properties which are single or multi-story. It also offers universal compatibility with ISPs and other hardware that may be already in existence in the home from those aforementioned Internet Service Providers. In fact, this powerful and future-proofed intelligent mesh system will actually replace the existing router in the property and is charged with finding the fastest path to the internet. It also blends this technology together with a clean and clinical node design that isn’t going to look ugly or intrude on the interior of a property. With this type of technology, there is a fear that the setup process is going to be overly complicated or that you would need extensive knowledge to be able to actually get this up and running. Thankfully, that isn’t the case as this comes with an accompanying Linksys iOS or Android application to walk you through the setup process to make it as easy and seamless as possible. If you have been struggling with the problem that this system resolves, then you could do a lot worse than introducing it into your life right now whilst this excellent 50% discount is still in place. There is a reason why these are on sale. They don’t work as advertised! Trust me, I have installed these and had to remove them. You must only use the better 3 band version model. I personally like the Ubiquiti Amplifi cube better. It is much easier to setup and looks high tech. Linksys however does work well and gives you the ability to hard wire remote APs. Their APP setup is really slow compared to Ubiquiti.